Multilayered bandaging is a part of the treatment including manual lymph drainage and intermittent pressotherapy. 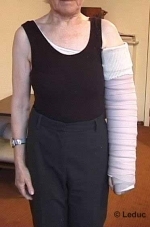 Bandages used in the treatment of oedema are short stretch bandages. Pressure recorded under the bandage, during muscular contraction, is more intense than with an elastic bandage. Short-stretch bandages are well supported at night. Stockinette: a cotton made butular bandage. This stockinette is placed around the limb to absorb sweat and avoid the direct contact of the foam with the skin. Stockinette must be applied without folds. Occasionally, a bandage type cellona may be applied below the foam bandage in order to protect body prominences or tendous. These bandages are covering the stockinette. They are applied on a circular mode with 50% overlaping . The foam must cover the limb and end more proximally than the edema. The spongy aspect of the foam bandage allows the adhesion of the short stretch bandages on the limb during movement. The short stretch bandage is applied on the foam on a circular mode with 50 % overlaping or spica according to the localization. Smooth the bandage with your hand. Apply using an even tension. Several layers are placed around the limb in order to get a rigid bandaging generating low pressure. The choice of bandaging is guided by the availability of the products on the market. These bandages may be worn while performing the usual activity. There is no need to interrupt work. It is not recommended to rest while wearing this bandaging; patient must stay active without excess. The multilayered band is worn day and night. It will be removed and re-applied every day (5x/week) for 1 to 2 weeks (sometimes more for the lower extremity). 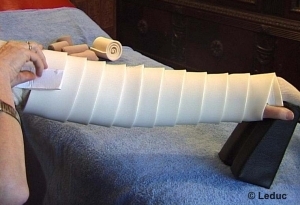 Multilayered bandaging is applied by the Physical Therapist / Occupational Therapist, only.